Many standard Crosby products come from the factory, equipped with RFID chips that you can program and utilize in your inspection efforts. However, what if you want to retrofit an RFID chip to a Crosby product in the field? No Problem!!!! We now have a NEW installation instruction manual available to attach RFID chips to selected Crosby Products. The installation instructions will show you the step-by-step process to add an RFID chip to the products to the left. 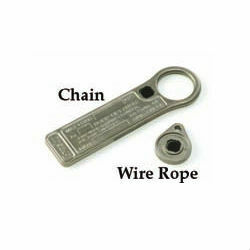 Heavy Duty, Prestamped, Zinc plated metal tag. 4-1/8" x 1-7/16" tag dimensions. 2-1/2" diameter metal attaching ring. 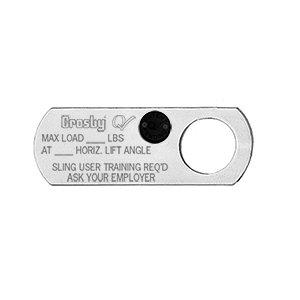 Tag prestamped for simple inclusion of sling type, Working Load Limit, reach, serial number, chain size and grade. 1-5/16" diameter ring opening (will fit 1/4"-5/8" A-1337). 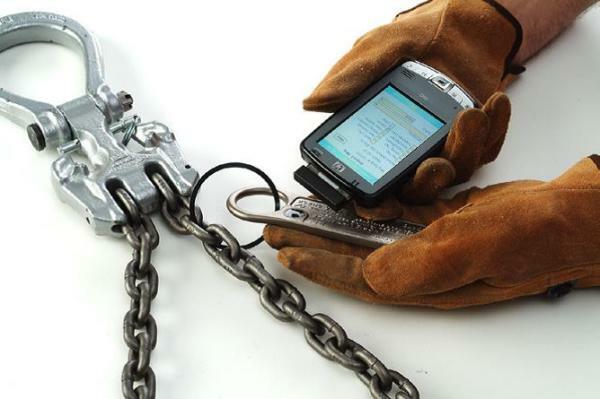 Chain tags meet requirements of ASME B30.9 for Sling Identification. Raised edge & recessed pads to protect lettering. Raised lettering for quick reference.